Whether you're looking for the perfect venue for a private birthday party, hosting an anniversary celebration, organising a corporate event or planning a reunion, Holey Moley Clarke Quay is the place to be! Located in the heart of the party zone at Clarke Quay, Holey Moley is the best private party venue in Singapore with an amazing selection of activities, from mini golf courses and bar games to mouth-watering food and drinks that are guaranteed to make your party an eventful one. 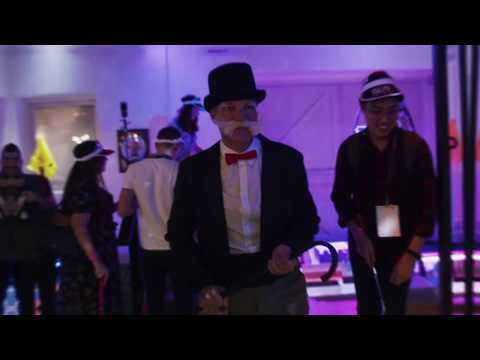 With countless insta-worthy mini golf holes, quirky interior décor, bar games and delicious treats that are sure to whet your appetite, Holey Moley is the choice venue for your private party in Singapore! Our dedicated exclusive events coordinators tailor each quote to create the perfect event for you and your guests. We offer exclusive use of the upstairs area, downstairs area or the whole venue for you and your guests. Prices vary depending on the size of your group, the date and time of your function and desired inclusions. To get a quote, or speak to one of our exclusive events coordinators, give us a call on 31290000 or send us an enquiry. To privately hire a space at Holey Moley Clarke Quay we require a minimum of 50 people. Got a larger group? No worries. We can cater for up to 450 people comfortably. When you book a private party at Holey Moley Clarke Quay you will score exclusive use of our Mini Golf courses. Mini golf is thirsty work, but never fear - the Caddyshack Bar will take care of you. Our event coordinator can help you tailor your function to include everything from an unlimited drinks package to a free flow bar tab complete with cocktails on arrival. The choice is yours. Our full service gourmet kitchen and dedicated chefs are here to cater your event. From gourmet finger food packages to metre-long pizzas and mixed share platters, we have different food options so you can fully customise your function with us. Whilst we have full team dedicated to feeding you, feel free to discuss other options or dietary concerns with our private events coordinator. Check out some of our food offerings below. Get in touch with one of our friendly Caddies and they will get back to you in no time.